The American Bully is a well rounded, reliable, trustworthy, and ideal family companion. The breed is very outgoing with an eagerness to please, while also maintaining a guardian role of his owners and property. An excellent companion dog to an owner who fully understands his desire to be loyal and protective, while gentle and loving. The American Bully should give the impression of great strength for its size. 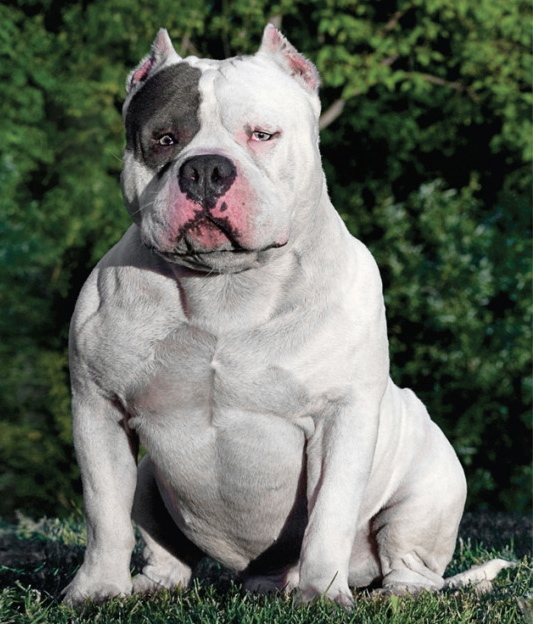 A medium size dog with a muscular body. Agile and graceful in its movement, keenly alive to his surroundings. He should be stocky, not long-legged or racy in outline. His courage is proverbial. Medium length, deep through, broad skull, very pronounced cheek muscles, distinct stop, and high set ears. The muzzle should be of medium length, rounded on upper side or slightly squared to fall away abruptly below eyes. The jaws are well defined, with the under jaw appearing strong. Upper teeth to meet tightly outside lower teeth in front or scissor bite accepted. Under shot or over shot mouths are not desirable. Lips close and even, some looseness accepted, but not preferred. All colors except albinism. Eye shape would be round to oval, low down in skull and set far apart. Heavy, slightly arched, tapering from shoulders to back of skull, and of medium length. No looseness of skin. Shoulders are strong and muscular with blades wide and sloping. Forelegs should be straight, while a slight turning outward of the feet is accepted, but not preferred. Large or round bones with pastern upright, with no resemblance of bend in the front. Forelegs should set rather wide apart to permit chest development. The back should be fairly short. Slight sloping from withers to rump or straight is accepted with gentle short slope at rump to base of tail. Slightly higher rears are allowable, but not preferred. Well-sprung ribs, deep in rear and all ribs close together. The chest should be deep and broad. Hindquarters should be well muscled, let down at hocks, turning neither in nor out. Stifles should be well bent. Feet should be of moderate size, well arched and compact. Short in comparison to size, low set, tapering to a fine point; not curled. Not docked, kinked or knotted. Short, close, stiff to the touch, and glossy. Very little grooming is required to keep the coat healthy. All colors and patterns are permissible expect the color merle. Height and weight should be in proportion. A height of about 18 to 21 inches at shoulders for the male and 17 to 20 inches for the female is to be considered preferable. There is no particular weight for the breed. The American Bully should be springy and drive off the rear. He should appear agile and graceful while in full movement.